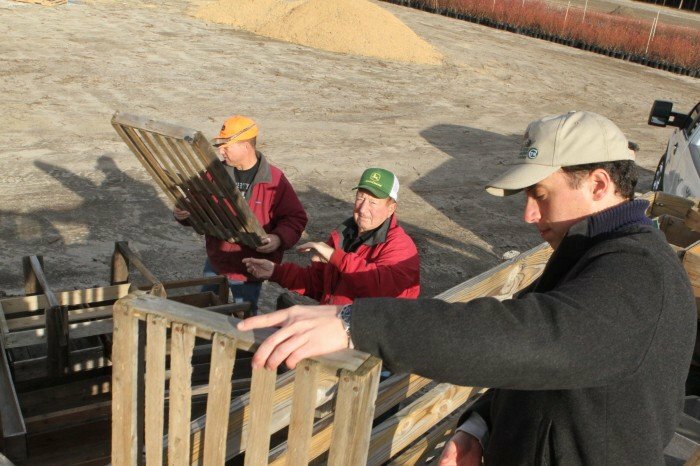 Michael DiMeo, left, Michael DiMeo Sr., and Anthony DiMeo, owners of DiMeo Fruit Farms in Hammonton, set up the farm Friday, Jan 6. The DiMeos try to raise more money through agritourism. The DiMeo Fruit Farms & Berry Plant Nursery is located on on Nesco Road in Hammonton. 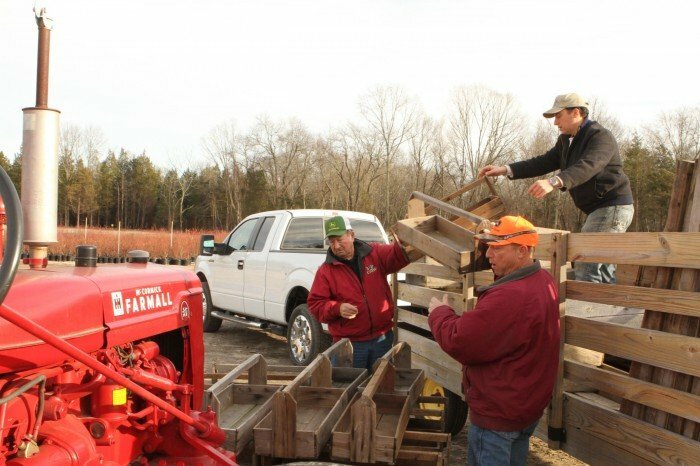 Michael DiMeo, left, Michael DiMeo Sr. and Anthony DiMeo set up the camp ground part of their farm Friday Jan 6. Anthony DiMeo III, didn’t always think of himself as a commodity like the fruits he grows at his farm in Hammonton. But he does now and, like a growing number of New Jersey farmers, he’s trying to cash in on it. “I really feel that people want to know their food. They want to know their farmer, and they find it can really be an enjoyable experience to come out to the farm and meet the farmer, as well as teach their children where their blueberries come from,” said DiMeo, 36. DiMeo, the owner of DiMeo Fruit Farms & Berry Plant Nursery on Nesco Road in Hammonton, said he is in the process of developing a new farm that centers on agritourism, allowing visitors to pick a variety of their own berries. In the meantime he has helped develop a business that, among other things, developed a nursery that grows blueberry plants to sell to visitors. Its website, dimeofarms.com, features an array of farm videos. In essence, DiMeo is branching into agritourism, a broad, catch-all term for making money by bringing visitors to the farm. The term can describe everything from pick-your-own farms to school-trip destinations to farm stands. Statistics show New Jersey is a growing, national leader in the field, ranking fourth in revenue generated. DiMeo’s videos caught the eye of Georgia Rodates and her husband, Ed, 58. The married couple made the three-hour journey from Fredericksburg, Md., to DiMeo Farms in early January, trailer in tow, to pick up 18 blueberry plants for their garden and another nine for a neighbor’s garden. He liked buying direct from the farmer because he could see the farm, talk to DiMeo and leave with substantial plants — not the frail twigs that he had bought from other centers, which died after a short time in the ground. The federal Census of Agriculture said that 204 farms in New Jersey earned a collective $1.2 million from agritourism in 2002. By 2007, the latest year for which statistics are available, the survey reported 322 farms had earned $24.7 million — a more than 20-fold increase in earnings. The U.S. Department of Agriculture conducts the census every five years. The next results are expected to be released in 2013. Across the country, the survey said New Jersey farmers are behind only Texas, California and Colorado in earning money from agritourism. The state’s farmers do much better than its neighbors in Pennsylvania and New York, where agritourism brought in $14.9 million and $18 million, respectively in 2007. Another survey, published in March by Rutgers, The State University of New Jersey, pegged the total value of state agritourism at in excess of $57.5 million, a figure that climbs to nearly $91 million when all the ancillary effects are counted. “Agritourism is an extremely effective way for farmers to help their bottom line,” while at the same time satisfying consumers’ interest in where their food comes from, state Secretary of Agriculture Douglas H. Fisher said. He said it is a growing trend that benefits both farmers and consumers. Richard W. VanVranken, the agricultural agent for the Cooperative Extension of Atlantic County, said agritourism is an opportunity for entrepreneurial farmers who have both the right location and the right personality to deal with the public. “With the ever-increasing cost of production in a state like New Jersey, it will be critical for farmers to take advantage of the close proximity of the customers here,” he said. Lynne Richmond, a spokeswoman with the state Department of Agriculture, said that the state encourages agritourism, promoting it through a state website that lists the offerings of the state’s farms: visitNJfarms.org. Offerings are slight during the winter dormant period, but wineries have a number of things going on. Beyond farms, the site lists places such as Cold Spring Village’s Living History Village in Cape May, now closed for the winter. Richmond said the state holds events such as a Christmas tree-cutting ceremony to promote New Jersey-grown trees, as well as other events to boost hayrides, corn mazes and New Jersey-grown and -pressed apple cider. Rita Muzzarelli, who runs Muzzarelli Farms in Vineland with her husband, Charles, said they started agritourism programs in 2002. In the spring, she said, children from preschoolers to about second grade take school trips to the farm. There, Rita Muzzarelli said the students are taught about life on the farm and are given small bags with seeds and potting soil to take home and grow on their own. Sometimes they invite a beekeeper to explain the value of bees and pollination to the farm. In the fall, the farm hosts a corn maze, a popular attraction that starts people calling for information in July. The maze features different designs, including the State of New Jersey and farmers feeding the world.